[S353] Edythe Rucker Whitley, comp., Marriages of Sumner County, Tennessee, 1787-1838 (Baltimore, Md. : Genealogical Pub. Co., Inc., 1981), p. 67. [S353] Edythe Rucker Whitley, comp., Marriages of Sumner County, Tennessee, 1787-1838 (Baltimore, Md. : Genealogical Pub. Co., Inc., 1981), p. 103 (giving her surname as Flipping). [S335] Kathy Wilcox, computer files sent to Roger Bartlett, 25 Nov 1997 (naming Ambrose Duffer as his father). [S335] Kathy Wilcox, computer files sent to Roger Bartlett, 25 Nov 1997 (naming Ambrose Duffer as her father). [S903] Kathy Wilcox, electronic mail to tnsumner-l, 3 Sep 2001, (naming Jesse Flippen as her father). [S903] Kathy Wilcox, electronic mail to tnsumner-l, 3 Sep 2001, (naming Mildred Robertson as her mother). [S335] Kathy Wilcox, computer files sent to Roger Bartlett, 25 Nov 1997 (naming Mildred Flippen as his mother). [S335] Kathy Wilcox, computer files sent to Roger Bartlett, 25 Nov 1997 (naming Mildred Flippen as her mother). [S335] Kathy Wilcox, computer files sent to Roger Bartlett, 25 Nov 1997 (naming Sarah Jane Duffer as her mother). [S335] Kathy Wilcox, computer files sent to Roger Bartlett, 25 Nov 1997 (naming Sarah Jane Duffer as this child's mother). [S335] Kathy Wilcox, computer files sent to Roger Bartlett, 25 Nov 1997 (naming Sarah Jane Duffer as his mother). [S335] Kathy Wilcox, computer files sent to Roger Bartlett, 25 Nov 1997 (naming Theodore S. Austin as her father). [S335] Kathy Wilcox, computer files sent to Roger Bartlett, 25 Nov 1997 (naming Theodore S. Austin as this child's father). [S335] Kathy Wilcox, computer files sent to Roger Bartlett, 25 Nov 1997 (naming Theodore S. Austin as his father). John Duffer's tombstone, Perdue Cemetery, Portland, Tenn., by Joel Randolph. [S982] Margaret Cummings Snider and Joan Hollis Yorgason, Sumner County, Tennessee Cemetery Records (Owensoro, Ky.: McDowell Publications, 1981), p. 13-5 (giving the year but not the place and giving his name as John Duffer). 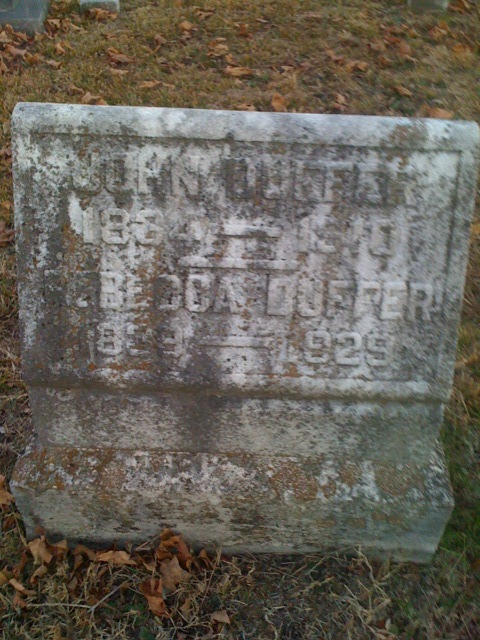 [S961] Find A Grave, online at http://www.findagrave.com, memorial for John Duffer, memorial no. 62095122, viewed on 30 Jul 2011 (giving the year but no other information). [S980] Era W. Stinson and Elizabeth Sue Spurlock, comps., Sumner County, Tennessee Marriages, 1839-1875 (Bowling Green, Ky.: n.pub., 1985), p. 38. [S335] Kathy Wilcox, computer files sent to Roger Bartlett, 25 Nov 1997 (stating that the marriage occurred between 1866 and 1870 and not naming the place). [S596] Melody Carter, electronic mail to Roger Bartlett, 19 Feb 2001. [S982] Margaret Cummings Snider and Joan Hollis Yorgason, Sumner County, Tennessee Cemetery Records, above, p. 13-5 (giving his name as John Duffer). [S961] Find A Grave, online, above, memorial for John Duffer, memorial no. 62095122, viewed on 30 Jul 2011. [S335] Kathy Wilcox, computer files sent to Roger Bartlett, 25 Nov 1997 (naming Jonathan Duffer as her father). [S335] Kathy Wilcox, computer files sent to Roger Bartlett, 25 Nov 1997 (naming Jonathan Duffer as his father). [S335] Kathy Wilcox, computer files sent to Roger Bartlett, 25 Nov 1997 (naming Lucy R. Gilliam as her mother). [S335] Kathy Wilcox, computer files sent to Roger Bartlett, 25 Nov 1997 (naming Lucy R. Gilliam as his mother). Rebecca Huntsman Duffer's tombstone, Perdue Cemetery, Portland, Tenn., by Joel Randolph. [S982] Margaret Cummings Snider and Joan Hollis Yorgason, Sumner County, Tennessee Cemetery Records (Owensoro, Ky.: McDowell Publications, 1981), p. 13-5 (giving the year but not the month or date or the place). [S982] Margaret Cummings Snider and Joan Hollis Yorgason, Sumner County, Tennessee Cemetery Records, above, p. 13-5. [S335] Kathy Wilcox, computer files sent to Roger Bartlett, 25 Nov 1997 (naming Rebecca Huntsman as his mother). Birth*: She was born in 1835. [S335] Kathy Wilcox, computer files sent to Roger Bartlett, 25 Nov 1997 (naming Flemming Duffer as this child's father). [S335] Kathy Wilcox, computer files sent to Roger Bartlett, 25 Nov 1997 (naming Flemming Duffer as his father). [S335] Kathy Wilcox, computer files sent to Roger Bartlett, 25 Nov 1997 (naming Flemming Duffer as her father). [S335] Kathy Wilcox, computer files sent to Roger Bartlett, 25 Nov 1997 (naming Eliza Ann Rutledge as his mother). [S335] Kathy Wilcox, computer files sent to Roger Bartlett, 25 Nov 1997 (naming Eliza Ann Rutledge as her mother). [S335] Kathy Wilcox, computer files sent to Roger Bartlett, 25 Nov 1997 (naming Seaton Duffer as his father). [S335] Kathy Wilcox, computer files sent to Roger Bartlett, 25 Nov 1997 (naming Nancy Elam as his mother). [S353] Edythe Rucker Whitley, comp., Marriages of Sumner County, Tennessee, 1787-1838 (Baltimore, Md. : Genealogical Pub. Co., Inc., 1981), p. 103 (giving her name as Emily T. McClary). [S335] Kathy Wilcox, computer files sent to Roger Bartlett, 25 Nov 1997 (naming Edward Duffer as his father). [S335] Kathy Wilcox, computer files sent to Roger Bartlett, 25 Nov 1997 (naming Edward Duffer as her father). [S335] Kathy Wilcox, computer files sent to Roger Bartlett, 25 Nov 1997 (naming Emily F. McClary as his mother). [S335] Kathy Wilcox, computer files sent to Roger Bartlett, 25 Nov 1997 (naming Emily F. McClary as her mother). [S335] Kathy Wilcox, computer files sent to Roger Bartlett, 25 Nov 1997 (naming Seaton Duffer as her father). [S335] Kathy Wilcox, computer files sent to Roger Bartlett, 25 Nov 1997 (naming Nancy Elam as her mother). [S335] Kathy Wilcox, computer files sent to Roger Bartlett, 25 Nov 1997 (naming William W. Duffer as this child's father). [S335] Kathy Wilcox, computer files sent to Roger Bartlett, 25 Nov 1997 (naming Rebecca Hawkins as this child's mother). [S335] Kathy Wilcox, computer files sent to Roger Bartlett, 25 Nov 1997 (naming William W. Duffer as his father). [S766] Chris Landram, "Duffer, Hawkins & Bell Family," online, http://www.rootsweb.com/~tnsumner/faabduf.htm, viewed on 14 Sep 2002 (naming William W. Duffer as his father). [S335] Kathy Wilcox, computer files sent to Roger Bartlett, 25 Nov 1997 (naming Rebecca Hawkins as his mother). [S766] Chris Landram, "Duffer, Hawkins & Bell Family," online, above, viewed on 14 Sep 2002 (naming Rebecca Hawkins as his mother). [S766] Chris Landram, "Duffer, Hawkins & Bell Family," online, above, viewed on 14 Sep 2002. [S980] Era W. Stinson and Elizabeth Sue Spurlock, comps., Sumner County, Tennessee Marriages, 1839-1875 (Bowling Green, Ky.: n.pub., 1985), p. 38 (giving her name as Malinda D. Bell). [S335] Kathy Wilcox, computer files sent to Roger Bartlett, 25 Nov 1997 (naming Abner Duffer as his father). [S766] Chris Landram, "Duffer, Hawkins & Bell Family," online, above, viewed on 14 Sep 2002 (naming Abner Duffer as his father). [S335] Kathy Wilcox, computer files sent to Roger Bartlett, 25 Nov 1997 (naming Abner Duffer as her father). [S766] Chris Landram, "Duffer, Hawkins & Bell Family," online, above, viewed on 14 Sep 2002 (naming Abner Duffer as her father). [S766] Chris Landram, "Duffer, Hawkins & Bell Family," online, http://www.rootsweb.com/~tnsumner/faabduf.htm, viewed on 14 Sep 2002 (naming Pleasant V. Bell as her father). [S766] Chris Landram, "Duffer, Hawkins & Bell Family," online, above, viewed on 14 Sep 2002 (naming Lucinda ['Lucy'] Gaines as her mother). [S766] Chris Landram, "Duffer, Hawkins & Bell Family," online, above, viewed on 14 Sep 2002 (giving 23 Apr 1860 as their marriage date). [S335] Kathy Wilcox, computer files sent to Roger Bartlett, 25 Nov 1997 (giving 23 Apr 1860 as their marriage date). [S335] Kathy Wilcox, computer files sent to Roger Bartlett, 25 Nov 1997 (naming Malvina D. Bell as his mother). [S766] Chris Landram, "Duffer, Hawkins & Bell Family," online, above, viewed on 14 Sep 2002 (naming Malvina D. Bell as his mother). [S335] Kathy Wilcox, computer files sent to Roger Bartlett, 25 Nov 1997 (naming Malvina D. Bell as her mother). [S766] Chris Landram, "Duffer, Hawkins & Bell Family," online, above, viewed on 14 Sep 2002 (naming Malvina D. Bell as her mother). [S961] Find A Grave, online at http://www.findagrave.com, memorial for James H. Duffer, memorial no. 66534591, viewed on 30 Jul 2011 (naming Melvianna Bell-Duffer as his mother). [S335] Kathy Wilcox, computer files sent to Roger Bartlett, 25 Nov 1997 (naming William W. Duffer as her father). [S335] Kathy Wilcox, computer files sent to Roger Bartlett, 25 Nov 1997 (naming Rebecca Hawkins as her mother). [S980] Era W. Stinson and Elizabeth Sue Spurlock, comps., Sumner County, Tennessee Marriages, 1839-1875 (Bowling Green, Ky.: n.pub., 1985), p. 31 (giving his name as Isaac Wesley Culwell). [S335] Kathy Wilcox, computer files sent to Roger Bartlett, 25 Nov 1997 (naming Emily Ann Duffer as her mother). [S335] Kathy Wilcox, computer files sent to Roger Bartlett, 25 Nov 1997 (naming Emily Ann Duffer as his mother). [S335] Kathy Wilcox, computer files sent to Roger Bartlett, 25 Nov 1997 (naming Isaac Wesley Caldwell as her father). [S335] Kathy Wilcox, computer files sent to Roger Bartlett, 25 Nov 1997 (naming Isaac Wesley Caldwell as his father). [S708] Charles Jones, electronic mail to Roger Bartlett via GenCircles, 18 Oct 2001. [S335] Kathy Wilcox, computer files sent to Roger Bartlett, 25 Nov 1997 (stating that she was born on 3 May 1828 in Wilson Co., Tenn.). [S708] Charles Jones, electronic mail to Roger Bartlett via GenCircles, 18 Oct 2001, (not giving the date and stating that they married in Tenn.).